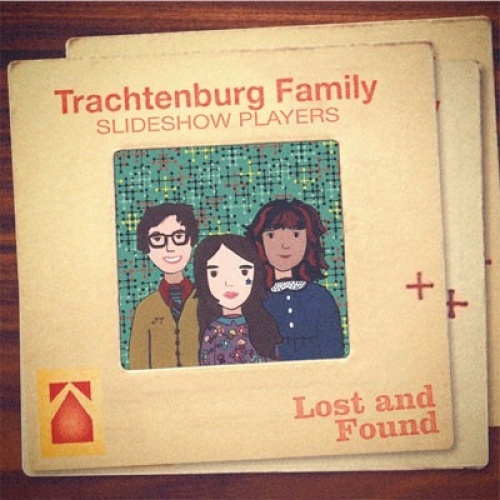 In a world where most pop bands are, like it or not, mere carbon copies of each other, the Trachtenburg Family Slideshow Players stand out as something unique. They're a vaudevillian performance art troupe that plays sunny, skewed pop songs based on (or so they would have you believe) the images they find on discarded slides they pick up in thrift stores and out of the garbage. On stage, mama Tina Piña Trachtenburg shows the slides that inspired the tunes, daddy Jason plays guitar and piano and sings, and daughter Rachel plays drums. Rachel was only six when she became part of the band, and fairy unskilled, but she's developed into a fine, nuanced percussionist as she's grown up. Since there are no visuals on CD, the songs have to stand on their own, and they do, thanks to Jason's strong melodic gift and intelligent wordplay. And while the tunes are cast in the mode of classic pop songs, they're often served with a side order of social realism. A tuba pooting out oompah accents makes "Look at Me" sound like a mindless polka, but the folks at this dance are all drunk and slightly dazed. When they sing "Only music can set us free" you don't know if it's a serious thought or self-delusion. "Candy City" is a ukulele-driven psychedelic sugar rush sung by Tina and Rachel, but as they wallow in gummy bears and cotton candy they confess to being "just an average human being, not doing anything to benefit humanity." Tunes like "Open Everyday" and "You're the One Who's Made for Me and I Was Made for You" are nuggets of bright sunny pop with a hint of Beatles in the arrangements. Jason's serious side is showcased on "The Indoctrination Starts Young," which combines free jazz and spoken words to decry the lack of morality and consciousness in modern society. Could the tune be based on slides discovered in a certain Hollywood religious cult's garbage pail? "Christian Terror" is more serious, a quiet folk-rock song that describes the violence that swept through Zimbabwe during its war of independence.